The concept behind Rehab training is that the CORE structures around an injured area will be activated to give support but not strain the injury. This phase is when you are past the acute stage and are able to activate muscles without pain. If we start with the low back. The basic concept is to find neutral positioning in standing, sitting and lying down and then activate the core muscles in that posture. All exercises are performed slowly with control, using breathing to activate the core and simultaneously avoid any ”wobble” in the midsection. Instructions for this are under ländrygg stabilitets övningar: Step 1. Exercises should not hurt during or after performing them. Initially, you may want to restrict your self to exercises lying down. Eventually you want to do exercises on your stomach, on your sides, on your back and eventually standing. Other exercises which may be added can be found among the following pages, use your judgement to avoid exercises that are too advanced for the stage you are at. This stage of rehab can last from one month to several months depending on many different factors. 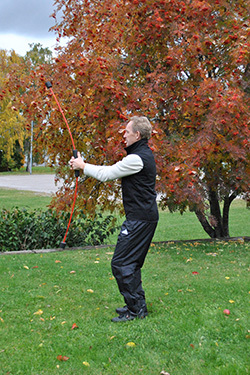 Focus on finding neutral positioning and slow controlled movements with the arms avoiding any ”wobble”. When you are ready, the next step is to add small weights or a resistance band to increase the difficulty of the exercises. Ask for tips. At this point you can also add resistance exercises for the upper body. These are exercises with machines or a resistance band standing up. You will want to warm up first with the exercises on the mat. During the resistance exercises, use breathing to activate the core. Gentle stretching exercises may be appropriate now as well and can be found in the links below. Stretching exercises should not provoke pain either during of after training. Avoid twisting and extreme positions of flexion or extension. Th next step is to add the cylinder exercises shown below. The concept is the same. Find neutral position on the cylinder with bent legs, activate both pelvic floor and trunk with controlled breathing. perform slow, controlled arm movements avoiding ”wobble”. Increase the difficulty of the exercises by adding a resistand band or small weights. This may be a time where you are taking short walks, swimming for short distances, biking for short, flat distances. In each of these integrated movement forms the goal is to maintain perfect posture and activate the core maintaining support while active. Once you have worked with these exercises for approximately 3 months and feel strong, it may be appropriate to increase the difficulty using the legs during training. Continue with the base exercises and add the legs. This adds quite a bit more strain on the back so it is wise to not be to quick to start these. At this point you may increase length of training on bike, in pool and/or walking. Avoid training in hills at this point. The next step to increase difficulty is to put a resistance band around the active foot, hold on to the band with hands, elbows on floor. Perform slow, controlled movements with the leg avoiding any ”wobble”. 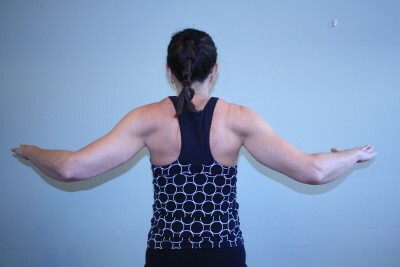 Once the back is stable enough to add twisting motions, it is appropriate to add on the following exercises. There may be certain exercises which are too tough, hop over them if that is the case. Condition training is often tolerated for 1 hour now, and again with perfect posture and an activated core. With neck pain, the goal is to train with the head directly over the shoulders or lying on the floor. Having your head off the floor is a strain on the neck unless it is hanging down in a comfortable stretch. Training with outstretched arms is also a strain on the neck. Bend the elbows and have them close to the body to reduce stress on the neck and upper back. Exercise machines where you pull are usually ok. Pushing weights up over your head is a strain on the neck. Rehabilitation exercises for the neck are found below a well as exercises to activate the muscles supporting the upper body and shoulders. Another dimension to training the neck is to activate an inborn reflex synchronizing eye movements , neck movements and balance (vestibular system). 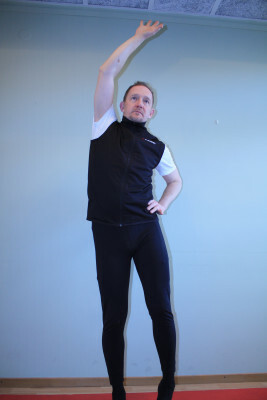 This reflex is inhibited with neck pain and is important in rehabilitation. These are described in neck stability. Elbow pain is usually a sign that you have strained your elbow in some way. It can be from monotone movements common when using a mouse, or from repeating the same larger movements as in tennis or golf. Once the elbow has been overstrained, it is less tolerant of other types of movements which require the same muscles to be active. Good ergonomics when using a desk are demonstated below under ergonomics. Having proper ergonomics is important to avoid not only elbow pain, but neck pain as well. Here is a group of pictures showing good ergonomics at home and in school. The basic principles are to vary standing and sitting. Standing is better for you body as long as it feels good. The screen should be at eye height until you use progressive eyeglasses, when the screen is slightly lowered. Avoid tilting your head to look at a screen. This protects your neck. The angle at the elbow should be 90 degrees and the lower arm resting and pivoting on the desk. This relieves shoulder and neck tension. Depending on the angle of the spine, it can be comfortable to have one foot on a stool, stand wide based with good posture. This training program is to strengthen the knee joint complex in the healthy athlete. Women, girls and people who are hypermobile in their joints benefit from training the knee joint. If the knee is injured these exercises are too tough to start with. This program is used for training with young girls and boys in a variety of sports, but particularly soccer and skiing where knee injuries are common. Exercises for everyday to activate core muscles. These are appropriate before work or school and as a pause during the day. äldreomsorgen för att visa ryggövningarna och ge råd om rygghälsa.